The Kick Galvanic: This is real love. I requested a kind officemate of mine to buy a pot of Boots Original Beauty Formula Cold Cream for me while she was in Bangkok last week for vacation. The product also has a vintage feel to it, and looks like something my grandmama would use. Well, older generations of women did use cold cream to remove skin impurities and retain that youthful look. When Kylie Minogue was asked about her ageless look, she revealed that her beauty secret was Pond's Cold Cream--and sales of that product in the UK soared in the next few days. Well, I'm not a Pond's fan, so I'd rather go for something like Boots' Cold Cream. It's a bit heavy on the skin, but I don't mind; I have really dry skin, so I kind of feel that my skin is 'drinking' in all that cold cream. Heavenly. Every time I'm in a Boots store in Bangkok, I always feel this mad urge to stock up. So whenever I get back to Manila, I have a load of Boots products in my luggage; I'm always afraid of running out of my precious supplies. 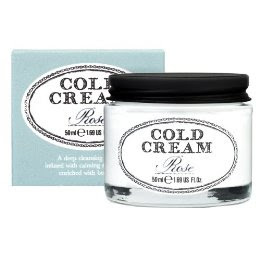 The skin balm and the lavender hand cream from the same Original Beauty Formula line are nice on my skin as well (perfect hand moisturizers while I'm working inside a deathly cold office), but this cold cream is turning out to be my favorite. Next time I'm in Thailand, I'm going to lug back some of that skin tonic and cleansing milk. I suggested to my fundraising teammate Tintin (another Boots fan) that the next time our regional manager Yas comes over to Manila, we can ask him to bring our pabilin (purchase requests) from Boots. She said I was dead crazy, as she couldn't imagine our no-nonsense Japanese boss lugging around a bunch of beauty products for us. Okay, maybe that was too much. It was just a suggestion, though...!